A school's plan to end arithmetic plus a math-crazy kid equals an entertaining expos� on the wonder of numbers. When the schools in Jeremy's town ban math, there are loud cheers from the kids. Even his teachers happily toss their textbooks. But Jeremy's best friend Sam, a self-proclaimed mathnik, sets out to prove that math is not only important, but fun. In the chapters that follow, Sam reveals math's presence in everyday places, including sports (types of triangles determine how a bike functions); art (artist M.C. Escher combined math patterns with imagination); and nature (ants instinctively calculate dead reckoning -- a navigation tool also used by astronauts). Meanwhile, surprising sidebars offer Jeremy's thoughts on weird concepts that range from chaos theory to cash prizes for new prime numbers. In the end, Jeremy, his teachers and even the Director of Education have to admit that school minus math equals all sorts of trouble. Complete with dozens of amusing real-life math examples, brief bios of seven famous mathematicians, and fun illustrations and diagrams, this innovative introduction to all things arithmetic will win over even the most math-phobic readers. About Cora Lee (Author) : Cora Lee is a published author of children's books. 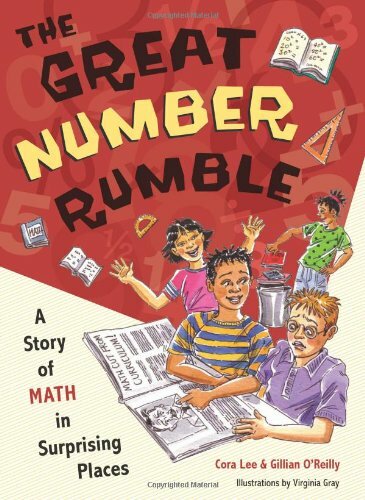 Published credits of Cora Lee include Great Number Rumble: A Story of Math in Surprising Places. About Viriginia Gray (Illustrator) : Viriginia Gray is a published illustrator of children's books. Published credits of Viriginia Gray include Great Number Rumble: A Story of Math in Surprising Places.